A new and unusual wasp species has been discovered during an expedition to the Indonesian island of Sulawesi. 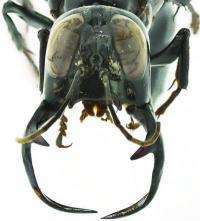 It was independently also found in the insect collections of the Museum für Naturkunde in Berlin, where it was awaiting discovery since the 1930s, when it had been collected on Sulawesi. The new species is pitch-black, has an enormous body size, and its males have long, sickle-shaped jaws. The findings have now been described in the open access journal ZooKeys. The species belongs into the digger wasp family, which is a diverse group of wasps with several thousands of species known from all over the world. Female digger wasps search for other insects as prey for their young and paralyze the prey by stinging it. Prey selection is often species specific, but the prey of the new species is unknown. With its unusual body size and the male's jaws, the new species differs from all known related digger wasps, so much so that it was placed in a new genus of its own, Megalara. 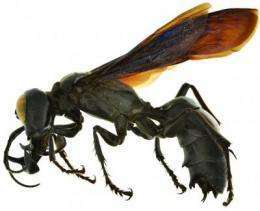 The new genus name is a combination of the Greek Mega, meaning large, and the ending of Dalara, a related wasp genus. Lynn Kimsey (UC Davis) and Michael Ohl (Museum für Naturkunde, Berlin), who discovered the giant wasp simultaneously and have worked on it in collaboration, named the species after Garuda, the national symbol of Indonesia, a part-human, part-eagle mythical creature known as the King of Birds in Hindu mythology. Since this species has never been observed alive, nothing is known about its biology or behavior. The males of Megalara garuda are distinctly larger than the females, and bear very long jaws. As can be deduced from other insects with large jaws, it is likely that the males hold the females with it during copulation. It is also possible that they use the jaws for defense.